Tufts University scientists have 3D printed a new series of metamaterials that possess unique microwave and optical properties. Metamaterials make use of geometric features arranged in repeating patterns at scales smaller than the wavelengths of energy being detected or influenced. Adding the latest tech in 3D printing to current fabrication processes could pave way for better metamaterials that offer more shapes and patterns – albeit on a much smaller scale. The Tufts team recently developed a hybrid fabrication approach using 3D printing, metal coating and etching, to create metamaterials with complex geometries and novel functionalities. They were able to create an array of tiny mushroom shaped structures, each holding a small patterned metal resonator at the top of a stalk. This particular arrangement permits microwaves of specific frequencies to be absorbed, depending on the chosen geometry of the ‘mushrooms’ and their spacing. 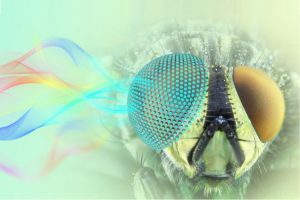 Such metamaterials could prove useful in applications such as medical diagnosing sensors and telecommunication antennas. Other devices developed by the Tufts team include parabolic reflectors that selectively absorb and transmit certain frequencies. According to the scientists, such concepts simplify optical devices by combining the functions of reflection and filtering into one unit. For instance, it would allow them to reduce the size of spectrometers and other optical measuring devices so they can be designed for portable field study. The products gained by combining optical patterning with 3D fabrication of the underlying substrate have been referred to as ‘Metamaterials Embedded with Geometric Optics’ (MEGOs). MEGOs absorb, enhance, reflect or bend waves in ways that would be difficult to achieve with conventional fabrication methods. The current study utilized stereolithography to polymerize photo-curable resins into the desired shapes. Newer 3D printing technologies could enable the fabrication of metamaterials that detect and manipulate electromagnetic signals of smaller wavelengths.